This summer, Plea for the Sea was fortunate enough to visit the Vancouver Islands and witness the ultimate in cetacean splendor: a pod of Orca whales in the wild! Seeing these amazing animals simply living their lives and enjoying the freedom of the open waters reminds us why we fight so hard for the Orcas who are sentenced to a life in captivity. We work toward the day when no more whales are trapped in tanks for entertainment purposes. Saving orcas in their natural habitats is the best way we can assure a future, healthy planet for our children and our children’s children. Have you ever had a dream about seeing Orcas in the wild? Waking up to the calming sounds of water and the calls from one orca to another? The smell of pine trees and the sun beating against your ocean kissed back.. simply amazing. 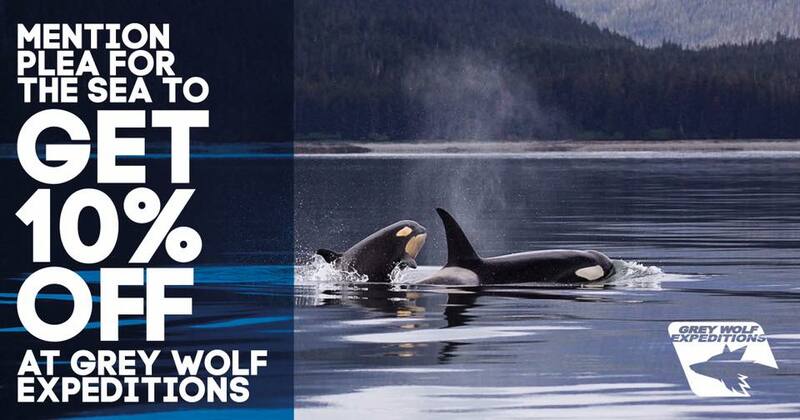 Grey Wolf Expeditions is offering our followers 10% off a booking for next year to see be in a prime location to hopefully witness the magic of an orca in the wild (other wildlife, too!) Plea for the Sea has partnered with them to bring awareness and support the idea of seeing animals in their natural habitat. Please contact them for more details and to book a trip for next year!